New tracksuits offered to the children of Maitreya School and Tara Children’s Project. 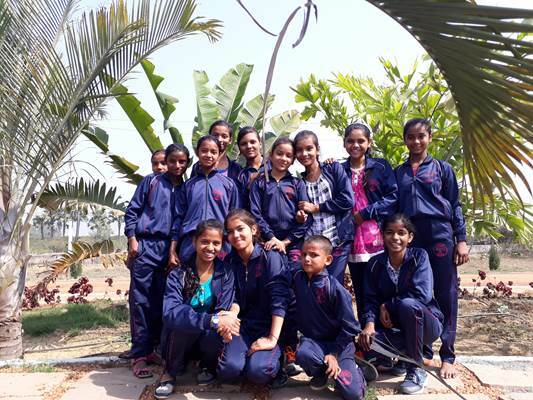 The charitable mission of Root Institute, located in Bodhgaya, India, is to provide support to impoverished children, adolescents and adults in neighboring areas through three focused projects. Maitreya School is a primary school providing free education for local children; Tara Children’s Project is a safe, nurturing environment for HIV-affected orphans; and Shakyamuni Buddha Clinic is a free hospital serving impoverished, local people via a variety of medical systems. 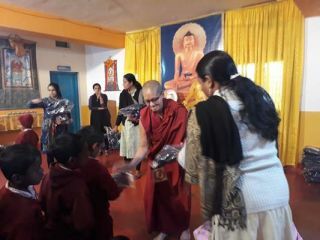 For the past six years, due to the kindness of one main benefactor, the FPMT Charitable Projects has been able to offer substantial grants toward this amazing work. Additionally, Lama Zopa Rinpoche personally offers support to these beneficial activities. Recently Rinpoche offered new tracksuits to all of the children of Maitreya School and Tara Children’s Project. Please rejoice in the ongoing support offered to the children of the Maitreya School and Tara Children’s Project. Lama Zopa Rinpoche Bodhichitta Fund enables Rinpoche’s compassionate service to others to flourish. All the offerings from the fund are used toward the creation of holy objects and extensive offerings around the world; sponsoring young tulkus, high lamas and Sangha in India, Nepal, Tibet and the West; supporting FPMT centers, projects and services; sponsoring Dharma retreats and events; funding animal liberations and blessings, and much more. Buddhist meditation doesn’t necessarily mean sitting cross-legged with your eyes closed. Simply observing how your mind is responding to the sense world can be a really perfect meditation and bring a perfect result.